Special Actors – Musical Theater classes for aspecial needs. Join our warm, inclusive group of actors, singers and dancers with special needs. You’ll be surrounded by friends, family, and caring, professional teachers and student aides who will help focus on your abilities and help them grow. We will spark your creativity, confidence, social interaction and self-esteem. And you’ll perform with your friends at our year-end show, a joyful night of fun and entertainment that’s open to the community. 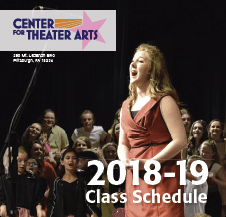 Working in age-appropriate groups, you will work with a team of teachers and student aides, following a musical theater format. You will learn through vocal warmups, songs, interpretive movements and theatrical games. You’ll focus individually on each skill: singing, dancing and acting. And then you’ll bring it all together at a year-end performance that’s open to family, friends and the community. “Highmark Blue Cross Blue Shield” has provided funding and become a program partner to this very special program. Buffet Dinner, Door Prizes, Chinese Auction, Silent Auction, Live Entertainment, Singing and Dancing. You can help support our Special Actors program by joining us at Prom Night, a prom-themed evening of food, fun, and entertainment held each autumn. Please contact the CTA office at 412-563-5080 for tickets and other sponsorship opportunities. If you’re unable to attend the event, please consider donating an item for the auction. Thanks!